In this post, we will try to explain a little about chaos theory, and its relevance to our attempts to understand and forecast the climate system. The chaotic nature of atmospheric solutions of the Navier-Stokes equations for fluid flow has great impact on weather forecasting (which we discuss first), but the evidence suggests that it has much less importance for climate prediction. In fact, this type of behaviour had already been identified and studied more than 60 years earlier by Poincare, in the form of the “3-body problem” of celestial dynamics. 2 stars (or planets etc) in orbit around each other will each follow a regular ellipsoidal trajectory around their joint centre of mass. However, when a 3rd (or more) body is thown into the mix, their future trajectories may be highly sensitive to the precise initial conditions. One extremely useful result of chaos theory is the design of complex orbits that enable spacecraft to travel great distances in a fuel-efficient manner, by analysing the Earth, Sun and spacecraft as a 3-body system (eg see the articles here and here). Back in atmospheric physics, chaotic behaviour is a highly-studied and well-understood phenomenon of all realistic global models, arising directly from the nonlinearity of the Navier-Stokes equations for fluid flow. So any uncertainty in the current atmospheric state, however, small, will ultimately grow and prevent accurate weather forecasts in the long term. This is the sort of thing that is easy to show with numerical models of the atmosphere. Simply perturb a reference run, and see what happens. So long as the perturbation is not rounded out by the limited numerical precision of the model, it will invariably grow. Here is an example using the HADAM3 model. One standard run was performed, and then another run was started where the pressure in a single grid box was changed by 10-10 (one part in 1015 of the model value) For a bit more about this experiment, see here. 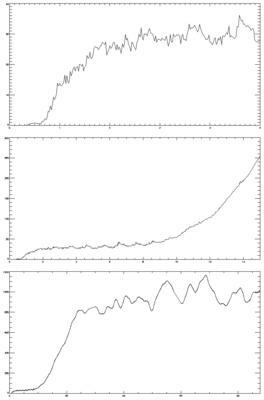 The first graph shows how the RMS difference in sea level pressure increases over time, and the second graph shows the evolution of the spatial pattern of differences. The perturbation rapidly saturates the highly local convective mode in the tropics, before more slowly spreading to the much larger mesoscale differences that matter to weather forecasters (note the scale changes). If this model resolved hurricanes, then their appearance and paths would be completely uncorrelated in the two runs – a classic example of the “Butterfly effect“. 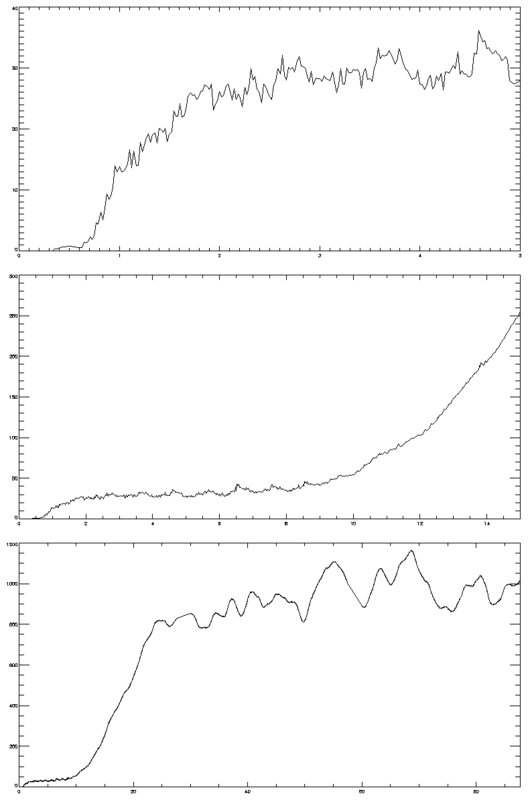 The x-axis is time in days: 0-5 (top); then 0-15 (mid); then 0-89 (bottom). By day about 25, and definitely by day 60, the difference between the runs has saturated: their weather is totally different, so no further growth in RMS occurs. The 5-10 day oscillations in the last month are what you’d expect to see from weather evolution. The y-axis is in Pascals. 100 Pascals is an hPa, ie 1 mb. Standard weather charts tend to plot pressure in contours of 4 hPa, so in real weather terms the diffs are sort-of negligible out to about day 15 (although this is a global value, so locally there will probably be bigger values). The top pic is about day 4 (in the not-much-happening phase). The middle, day 15 (in the exp growth). The bottom, day 31 (saturated). Note that the pics have a different contour interval. By days 15/31 we’re into “real meteorology” and hence the MSLP field is most different in extratropics, as it always is (its tropical dynamics, folks). Of course the existence of an unknown butterfly flapping its wings has no direct bearing on weather forecasts, since it will take far too long for such a small perturbation to grow to a significant size, and we have many more immediate uncertainties to worry about. So the direct impact of this phenomenon on weather prediction is often somewhat overstated. Chaos is defined with respect to infinitesimal perturbations and infinite integration times, but our uncertainties in the current atmospheric state are far too large to be treated as infinitesimal, and furthermore, all of our models have errors which mean that they will inevitably fail to track reality within a few days irrespective of how well they are initialised. Nevertheless, chaos theory continues to play a major role in the research and development of ensemble weather prediction methods. Although ultimately chaos will kill a weather forecast, this does not necessarily prevent long-term prediction of the climate. By climate, we mean the statistics of weather, averaged over suitable time and perhaps space scales (more on this below). We cannot hope to accurately predict the temperature in Swindon at 9am on the 23rd July 2050, but we can be highly confident that the average temperature in the UK in that year will be substantially higher in July than in January. Of course, we don’t need a model to work that out – historical observations already give strong evidence for this prediction. But models based on physical principles also reproduce the response to seasonal and spatial changes in radiative forcing fairly well, which is one of the many lines of evidence that supports their use in their prediction of the response to anthropogenic forcing. Fortunately, the calculation of climatic variables (i.e., long-term averages) is much easier than weather forecasting, since weather is ruled by the vagaries of stochastic fluctuations, while climate is not. Imagine a pot of boiling water. A weather forecast is like the attempt to predict where the next bubble is going to rise (physically this is an initial value problem). A climate statement would be that the average temperature of the boiling water is 100ºC at normal pressure, while it is only 90ºC at 2,500 meters altitude in the mountains, due to the lower pressure (that is a boundary value problem). We can demonstrate this sort of climate response clearly in the Lorenz model, or any more complex climate model. Perturbing the initial conditions gives a completely different trajectory (weather), but this averages out over time, and the statistics of different long-term runs are indistinguishable. However, a steady perturbation to the system can generate a significant change to the long-term statistics. Here is some output from a run of the Lorenz model in which a change was applied half way through. At time t=0, the parameter “r” (which relates to an idealised thermal forcing) is changed from 26 to 28. When viewed in close-up detail, the trajectory looks qualitatively similar before and after the change, but in fact the long-term statistics such as the mean value of z, and its 95% range, are changed. In this simple model, the steady perturbation changes the climate in a highly linear manner – increasing r again to 30 would add the same change on top of that shown for 26 to 28, and r=27 would sit half-way between the cases shown. Of course, these results cannot be directly extrapolated to the real climate system, but they do disprove the common but misguided claim that chaotic weather necessarily prevents meaningful climate prediction. In fact, all climate models do predict that the change in globally-averaged steady state temperature, at least, is almost exactly proportional to the change in net radiative forcing, indicating a near-linear response of the climate, at least on the broadest scales. The uncertainty is in the steepness of the slope, which is what “climate sensitivity” describes. It was thought until relatively recently that chaos provided a substantial practical challenge to so-called “optimal” model tuning and climate prediction with state-of-the-art climate models, since it generally prevents the use of one of the most powerful and widely-used optimisation and estimation procedures (an adjoint – eg Lea et al 2002). The obvious alternative method of exhaustively searching parameter space requires a huge number of model simulations, and the Climateprediction.net project is pursuing this approach. However, one of us recently showed how another efficient estimation method known as the ensemble Kalman filter can be applied to this type of problem (various applications here). This is certain to remain an active area of research for some time to come. The climate of a model can be easily defined in terms of the limit of the statistics of the model output as the integration time tends to infinity, under prescribed boundary conditions. This limit is well-defined for all climate models. However, the real world is slightly messier to deal with. The real climate system varies on all time scales, from daily weather, through annual, multi-year and decadal (ENSO), Milankovitch, glacial-interglacial cycles, plate tectonics and continental configurations, right up to the ultimate death of the Sun. The average temperature, and all other details of the climate system, will vary substantially depending on the time scale used. So how can we talk meaningfully about “the climate” and “climate change”? Well, although there are interesting scientific questions to ask across all the different time scales, the directly policy-relevant portion is on the multi-decadal and centennial time scale. It is quite clear that the perturbation that we are currently imposing is already large, and will be substantially larger, by up to an order of magnitude, than any plausible natural variability over this time scale. So for the policy-relevant issues, we generally focus on the physical atmosphere-ocean system, sometimes with coupled carbon-vegetation system, and treat the major ice sheets, orbital parameters and planetary topography as fixed boundary conditions. It’s an approximation, but a pretty good one. solar energy either other new energy-systems for the cars….Would we,should we have less CHAOS? N.B. :In my country:the Kingdom of Belgium,there is one day in the week without cars.It is called :pro-velo. First, the more appropriate scientific definition of climate is that it is a system involving the oceans, land, atmosphere and continental ice sheets with interfacial fluxes between these components, as we concluded in the 2005 National Research Council report. Observations show chaotic behavior of the climate system on all time scales, including sudden regime transitions, as we documented in Rial, J., R.A. Pielke Sr., M. Beniston, M. Claussen, J. Canadell, P. Cox, H. Held, N. de Noblet-Ducoudre, R. Prinn, J. Reynolds, and J.D. Salas, 2004: Nonlinearities, feedbacks and critical thresholds within the Earth’s climate system. Climatic Change, 65, 11-38. That the model simulations that you discuss in your weblog do not simulate rapid climate transitions such as we document in our paper illustrates that the models do not skillfully create chaotic behavior over long time periods as clearly occurs in the real world. That climate is an integrated system and is sensitive to initial conditions is overviewed in Pielke, R.A., 1998: Long-term variability of climate. J. Atmos. Sci., 51, 155-159). We show in this study that even short-periodic natural variations of climate forcing can lead to significant long-term variability in the climate system. We need to move the discussion to studying climate as a complex, nonlinear system which displays chaotic behavior if we are going to provide scientifically robust understanding to policymakers. Readers of your weblog are invited to read my postings at http://climatesci.atmos.colostate.edu if they would like to read a different perspective on climate science. When you say this clearly occurs in the real world, I am wondering what specific examples you are thinking of. It is certainly difficult to test this statement, to agree or disagree, without knowing more about what you are thinking of. As you state that this occurs on all timescales, especially interesting, I think, would be example where this has happened on a multi-decadal timescale, and if possible, in general terms, from what feedbacks the chaos arose. RE #2, I think policy-makers, inventors, and people in general had plenty of info back in 1990 (before scientific certainty on GW) to spur them on to greatly reduce GHGs, esp through cost-effective means. But, idiocy happens (and moderators, please keep this – it’s meant to be humorous & not directed at anyone in particular). Of course it would be nice to know exactly how and when we’re going to really suffer — abrupt CC, runaway GW, mass extinction event, or just a linear ratcheting up of the same (floods, droughts, heatwaves, sea rise/land loss, disease spread, mega-storms, glacier melt, famines). We need to “be prepared” for (as you often suggest) AND “strive to avert” the worst, while hoping for the best (Nanny’s projected outcome). I’m no policy-maker (except in my own home), but you’d think that principle would be taught in Policy-Making 101. Even if initial conditions are important to long-term climate, that’s water under the bridge now. (That darned Paleolithic hunter band that started forest fires to herd mammoths into bogs for easy kills. Where was Smoky the Bear when we really needed him?) Now, we have to start making the best of a bad situation. These make so much sense & are so dangerous in their implications, that the burden of proof should be on the contrarians or skeptics to prove these things are not happening. And even if they do, we still have many many other reasons, aside from GW, to reduce our actions that increase GHGs. So, to the extent that we’re smart and able, let’s ease up on the GHG trigger, or we might be shooting our own descendents. But I do appreciate the meticulous ongoing work to understand in excruciating detail and minutia just how we are harming ourselves. Seems like you are describing a chaotic system with many basins of attraction. Occasionally the climate will jump basins on short time scales. The current models cannot explain these jumps. Your definition of climate does not include external factors, such as changes in orbit, meteor impacts, solar forcings, volcanoes and AG CO2. The external factors would cause the climate system to change and the basins to shift. 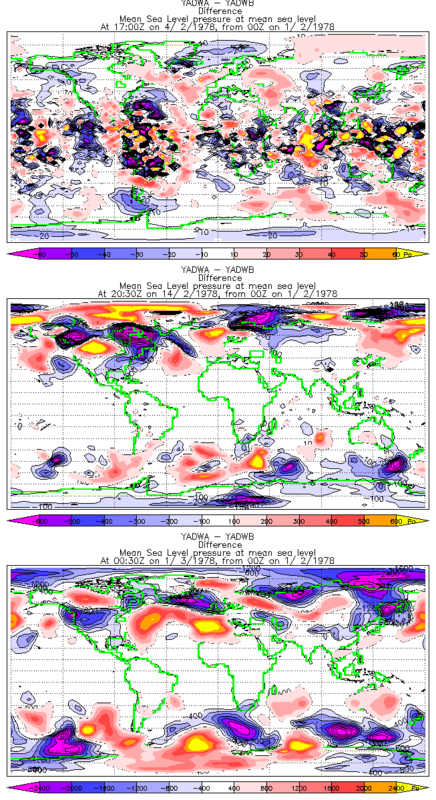 Seems like the climate models may describe a part of the climate system, i.e. how a the current basin of attraction will shift dynamics based on various forcings. However it will not model or explain the complete system or the jumps to different basins. Am I way off base here? William, re: your response to #2. ….Climate in a wider sense is the state, including a statistical description, of the climate system. The climate system is the highly complex system consisting of five major components: the atmosphere, the hydrosphere, the cryosphere, the land surface and the biosphere, and the interactions between them. The climate system evolves in time under the influence of its own internal dynamics and because of external forcings…. In my opinion, the differences between Professor Pielke’s definition and what is in the IPPC glossary are very minor. Here’s an example from sociology re micro & macrolevel analyses. As we know suicide is (usually) an intensely personal act, with a wide variety of personal factors that may be involved. However, Emile Durkheim, wanting to steer sociology away from psychological determinism, proposed that social facts cause social facts, including suicide rates. He noted that suicide rates remain fairly constant year to year, perhaps trending up or down slightly, and varying from place to place, country to country, according to various sociocultural factors. While it may be difficult to predict an individual suicide, it is not so difficult to predict (and explain) suicide rates. Human behavior is much more complex than “natural” systems (which is why our “human system models” may not be as good as your climate models), and yet there are these fairly stable suicide rates. So, I have no problem understanding that climate (macrolevel) is much easier to predict & understand than chaotic weather (microlevel). Who really knew last year Katrina would slam into New Orleans this year? But we did have some idea that storms may likely increase in intensity and frequency with global warming (I had some Earth Day displays back in 1990 suggesting such). I make be skating on thin ice here, but the way I see it, the first law of thermodynamics points to some macro-, big picture understanding of climate. Energy may change forms, but it isn’t disappearing…at least anytime fast (second law). Correct me if I’m wrong on this, but no amount of micro-level chaos will “puff” make that excess energy being trapped due to the anthropogenic greenhouse effect disappear. Is this too simplistic an assessment? I’m really not sure what nits Roger (#2) is trying to pick here. We explicitly agree (final paragraph of main article) that the climate has historically shown significant variability on all time scales. People have looked hard for possible “exciting” transitions from the current system, and so far have pretty much drawn a blank. Eg see Science 21 October 2005: 432-433 (sorry, subscription required). With the anthropogenic perturbation likely to be around 2C and maybe more in the next 100 years (that’s a global average, it will be much more over northern hemisphere land where we actually live), there are simply no comparable sources of natural variability, and the historical record shows that such temperatures have not been approached in the last 2000 years. I don’t by any means think that current climate models are the whole answer, but it seems clear that their outputs are directly relevant to anyone who is interested in the future of the climate system. I think what Dr. Pielke is referring to are climate shifts such as the Dansgaard-Oschger Oscillations at the bottom of the ice age somewhere between 60K and 35-40K B.P.. Paleo-evidence suggests that temperatures rose several degrees in a matter of decades to centuries, which compare to our current rate of contemporary warming. But Dr. Pielke’s tone seems to be one (again) of excessive eagerness that the rest of the community adopts his views (re his web blog at http://climatesci.atmos.colostate.edu/). Maybe he should exercise a bit more patience and remember that he too can make mistakes from time to time. This of course does not invalidate his very worthwhile and fundamental contributions over the years. Dan-there are numerous examples of sudden transitions on all time scales. For example, I mentioned the 16th Century megadrought in my reply to William, which is well documented in the proxy record. During the 20th century, we had the dust bowl years of the 1930s when many all time heat records occurred (and many of them remain records today). The 2002 drought in western North America is a shorter term transition, which has already shifted to a different wetter regime. In terms of how we are altering the climate, it is these sudden transitions that we need to understand, rather than focus so much of our resources on assessments of the global averaged temperature trend. Greg-your comments are excellent. The 2005 National Research Council report does include the external climate forcings of the Sun and orbital characteristics of the Earth, as well as volcanoes. Both natural and human climate forcings could precipitate transition changes.The climate system can “jump basins” on both short- and long-time scales, and on global and regional scales. Regarding the reply to Brook’s comment #6, William – how is the “climate system” different from “climate”? As I discussed in my weblog of July 29th entitled “What is Climate Change?”(http://climatesci.atmos.colostate.edu/?cat=2), there is a clear inconsistency in how these terms are used. The 2005 National Research Council report has attempted to remove this inconsistency by adopting the more integrative and inclusive definition of climate. The new IPCC report should address this issue also. James-regarding your comment #8, I completely agree with you that we need to apply models to better understand climate system processes in response to the spectrum of natural- and human- climate forcings and feedbacks. I have numerous papers that utilize this approach. However, to comminicate to policymakers that the models provide skillful multi-decadal regional and global predictions grossly oversells their capability. We can both agree that we should work to minimize the human alteration of the chemical composition of the Earth’s atmosphere, but still disagree whether we can skillfully predict the climate consequences of such actions. I think eventually science even may be able to predict microlevel weather, which is interconnected with the macrolevel climate, once “post-chaos” theory is discovered. Science may even one day be able to go back and attribute, say, 5.312% of Katrina’s intensity to AGW. In my crystal ball is a super-computer that hasn’t even been imagined yet. Meanwhile, there’s no reason not to continue reducing our GHGs. I think this exchange illustrates a real problem that we have in this field, that of distinguishing sudden transitions (regime shifts) from colored noise. The standard 30-year average will not pick up either, as it smooths transitions. But in general the tests that climate modellers do when they claim “regime shifts” aren’t particularly statistially rigorous. On the other hand, the problem may simply be that we aren’t looking in the right space. We had a recent talk by Ming Cao at Florida State in which he showed that the NAM was a very coherent structure when looked at in terms of airmass coordinates, but not in standard x-y coordinates. So the problem may simply be that we’re not looking for nonlinear behavior in the right way. The use of proxies is often particularly problematic, as biological proxies can show strongly nonlinear responses to climate changes. Since you accept that there are two definitions, and one of them is the one stated in the post above, I’m not sure why this definiton has become “incorrect”, rather than simply a definition that is not the one that you prefer. I agree that the definition is critical. If you consider as a decade-long anomaly in temperature or precip over a relatively local area (e.g., the dustbowl) to be “climate”, I presume you will get fewer quarrels that climate can be chaotic. Obviously, shorter the time-series and smaller the area, the more climate starts to look like its more chaotic cousin – weather. The fact that the dustbowl did not endure to could be used to argue the opposite view though – that the initial condition in 1930 may indeed have influenced the “weather” in 1937 (who knows), but ultimately was no longer relevant by 1950 to the “climate”. Unless you can show me that it was. It’s curious to me that Dr. Gray is also from Colorado State. What makes climatologists from here skeptical of global climate change? I’m sensing more politics than science in this protest. I have no problem reconciling the IPCC definition of “the climate system” to include (eg) interations with the cryosphere, with the use of fixed icesheets in models when considering how the climate will evolve over the next decades. As we said in our final paragraph, it may not be strictly precise but the approximation is a good one. I do agree that as one starts to look at smaller scales and finer details, the skill of any prediction is likely to decrease. But the broad pattern of warming appears robust. This is of course one big reason why climate science has focussed on this particular metric – because the models can do a reliable and credible (validated through hindcasting recent and paleo climates) job at it! Discussing semantics over whether climate models are seperate in nature to Weather models does not improve our capacity to define/predict the past nor future climate conditions. Einstein didn’t like chaos or probabilities , for me Met. chaos is born from a lack of resolution on a spatial and temporal sense. Sudden regional Climate shifts are not isolated events and transpire from a 3D flux of air coming from everywhere outside from the same region. Is astounding to state that Global temperatures are not of primary importance. G.T.’s is a climate and meteorological guide of great value. From this number transcends the rest of the met world. For instance this coming winter weather is based on what G.T.? If someone is not using a G.T. forecast as a base of their reasoning, this may explain their failure to successfully predict near future weather. As a recent past example I would suggest that 2005 hurricane season was very predictable because Historical high temperatures were forecasted by Hansen at NASA. Climate models should also be inputed with 100 year old archived weather data to start them up, after a couple of runs, lets see if they can predict contemporaneous climate stats. Those who can do so will alleviate some needless arguments, its better to see if they can predict the future more or less correctly, this is the very nature of this science, be correct or back to the chalk board! The issue we need to debate is not whether the global average temperature changes by 0.1C or 0.2C over the next decade (or whatever). We need to assess the predictability of regional climate changes that have serious societal and/or environmental consequences. This includes any change in our risk to drought such as the West had in 2002. Models cannot skillfully predict the change in probability of such events. This is why we have encouraged the adoption of a vulnerability framework as more inclusive and useful to policymakers than the global average temperature predictions. This seems to imply that the rate of divergence of state space trajectories is a strong function of their initial distance apart. I do not see this in the math, has it been demonstrated? The alternative is that in many cases we are at the chaotic time limit to predictability, so better data or models will not extend the time horizon or improve predictability. Mark – To call RPSr. “skeptical of global climate change” reflects a particularly odd reading of his work, and is a good example of the sort of tribal thinking (your inference that his reasons are “more politics”) that negatively infects this debate. His work clearly shows that he is not “skeptical of global climate change.” His argument is that emphasis on one part of that change – globally averaged long term trends – fails to capture the stuff that’s the most important for policymakers and the public to know. My last post, I see now, was riddled with typos, so let me try again. I think some further explanation of the statement, “Observations show chaotic behavior of the climate system on all time scales, including sudden regime transitions” is warranted. I question it on a few fronts. First, the dustbowl example is a temporary effect. I seriously doubt whether a change to initial conditions in 1930 is affecting weather in Oklahoma now. This is very different from the weather example in the post, where changes to initial conditions cause a divergence that never again converges. As to the example of the megadrought in the 1600s, I know little about this, but can you be so certain this was the result of chaos and not a change in forcings, or a non-chaotic combination of a change in forcings timed with a cyclical ENSO-like event? Finally, again, if you define climate broadly enough, to include a regional weather change that lasts a few years, then it seems likely that chaos could play an important role. However, your statement appears to suggest that you also believe that, for example, the Global Mean Temp from the years 2070 thru 2100, will depend on chaotic effects. Do you think this is so? Or would you accept that this aspect of “climate” is almost entirely driven by the forcings themselves? Where James Annan is going wrong is not knowing that chaos is caused by positive feedback forcings. You don’t get the butterfly effect unless you have a positive feedback. If you have negative feedback then the momentum from the flap is dissipated quickly. It is not a matter of “Or”. If the climate system is chaotic, then the forcings are positive feedbacks. A climate driven by these forcings will be chaotic. James Annan seems to think that these forcings have something to do with flows through tubes. The chaos (turbulent flow) in a tube is due to the forcing of (pressure applied to) the liquid through the tube. This causes a back pressure due to the friction against the tube sides which increases the pressure in the tube. It is this positive feedback on the pressure which leads to the turbulent flow (chaos) in the tube. To make my position quite clear, it is not the friction of air with the surface of the earth which causes the climate to be chaotic, (although this seems to be what James Annan thinks! ), it is the positive feedback effect from the greenhouse effect of water vapour (unique to our planet) which is the main driver of the global climate (system). “in those times (D-O osc) when the climate arguably *was* chaotic”. I find it difficult to imagine a climate (system) that switches in and out of a chaotic state. To me, it seems that the climate is either chaotic or not chaotic. The Tiamat Hypothesis, not eponymously named by me, proposes that the climate is chaotic, and that it is driven partly by the Clausius-Clapeyron relationship for water vapour, and partly by the changes in the state of water. If you have any evidence that this hypothesis is false then I would very much like to learn of it. There are no such things as “feedback forcings.” There are feedbacks, and then there are forcings. They are not one. There was a point previously that seems to have been missed, but that I am quite interested in. The climate certainly doesn’t appear to be in some large, chaotic attractor, which would include both glacials and interglacials. Instead, it appears that the shift between glacials and interglacials is a change from one attractor to another, with the glacial attractor exhibiting (possibly) chaotic oscillations in the DO cycles. Certainly the Holocene appears to be governed largely by negative feedbacks, which have led to the relatively stable of the last 10,000 years. But here’s the thing: the transition between these attractors looks to me to be clearly governed by positive feedbacks. It is rapid, dramatic, and does not appear to allow for immediate regression to the earlier state when the external forcings (orbital parameters) return to their previous level. This looks like hysteresis in a multistable system to me. Under certian conditions, there clearly must be positive feedbacks, or else I don’t know how you can explain the end of the last ice age. The problem with multistable systems is that the governing dynamics in one attractive region are notoriously difficult to estimate from another attractive region. This means that models parameterized in one region of state space very often completely miss the existence of other attractors, because the governing dynamics in those other attractors are not important in the region in which the model was parameterized. Next, we know that we do not incorporate biotic feedbacks well at all in our models. This has always struck me as a real problem–we can build models that spontaneously produce hurricanes (which is amazing!!! ), but that leave out what is probably one of the largest drivers of global climate around (witness the correlation between CO2 and temperatures over the past half million years). How can we be comfortable saying that climate is stable when we can’t even really model such a huge force? It seems to me that we have become overly comfortable simply because our models do such a good job of predicting small changes within our current attractor. If you think all forcings involve feedbacks, please explain how changes in the radition emitted by the sun are part of a feedback loop and driven somehow by climate change on remote and microscopically small planet earth? Also, you will need to explain how the Mt. Pinatubo eruption was part of a feedback loop. These are independent forcings. CO2 is more complicated and arguable over a long time-scale. I am no expert on this. But it is pretty clear that in the 20th century, change in C02 concentration was driven by fossil-fuel burning, not by any carbon-cycle feedback loop. The Response by William > … People do worry about rapid change, but at the moment it doesn’t seem most likely – William]. < My response is that rapid climate change is happening, evidenced by observed changes in global ice conditions and global tempertures from the late 1970s to present. My response is that rapid climate change is happening, evidenced by observed changes in global ice conditions and global tempertures from the late 1970s to present. Re: #32 ‘Rapid’ is obviously a relative term. By ‘rapid’ I would be thinking more about sudden changes caused by the collapse in the Atlantic THC, or an Amazon die-back. I guess the more important distinction would be the ~linear response to forcing [which we are observing now] and more non-linear effects created by the dynamics of the climate system responding to the external forcing. The IPCC define the greenhouse effect of carbon dioxide as a forcing and the greenhouse effect of water vapour as a feedback. If you accept the IPCC usage, then those two things are entirely separate. However both do in fact force global temperature, therefore both could be called forcings and the greenhouse effect of water vapour would then be a positive feedback forcing. That is the usage I employed. Lorenz discovered that if you increase the ‘gain’ beyond a certain point then you get oscillation/bifurcation/a strange attractor. He was working with convection where condensation of water vapour is important. From a climate system POV it is the evaporation of water, and the resulting vapour pressure which is important. Saturated water vapour pressure increases quasi-exponetially with temperature, and so as sea surface temperatures rise, so will the positive feedback from the greenhouse effect of water vapour. This means that the climate system must be chaotic, and it seems likely that ENSO is a strange attractor. Nicely done, gentlemen. I wish I had time to jump into the fray right now. Regardless, kudos on your article which will hopefully provide a good point of reference on this matter which has heretofore engendered so much confusion. I think the article below shows “rapid” global climate change. I think the quibbling about the precise definition of “climate” is rather beside the point. I also think that a few critical points on the nature of short-term and long-term chaos in the climate system have been lost in the present rambling discussion, and I hope to provide a little focus below. I would say that the key issue is whether the forcing provided by increasing greenhouse gases is sufficiently strong to overcome the possible sensitive dependence on initial conditions that may lurk in the climate system on time scales of decades to centuries. In other words, it is possible that the the climate system does exhibit some kind of long-term chaos in some circumstances, but that the forcing is strong enough to wipe out any significant uncertainty due to initial conditions — at least if one is content to forecast statistical quantities such as, for example, decadal mean January temperatures in some suitably large region, or perhaps temperature variances or quartiles taken over a similar period. The working hypothesis is that even if the climate system may have the possibility of long-term chaos, it is nonetheless more like William’s example of what happens when you change a parameter of the Lorentz model, than it is like the problem of predicting a single day’s weather a year ahead. Most of what we know from observations and simulations supports this view. There is not a single example of a simulation of the coupled ocean-atmosphere-sea ice system that spontaneously generates a change as big as doubling CO2, in Holocene type conditions. Ensemble runs do fluctuate about the mean upward trend, but the trend is clearly beyond the difference amongst the ensemble members. Of course, it is possible to argue that the models are missing something critical and that there is a ‘switch’ in the climate system that could be triggered under circumstances that may be sensitive to BOTH the increase in GHG and some special initial condition. In essence, what we argue for in the NRC abrupt change report is a concern for the possibility that there is indeed some presently unknown switch in the climate system that could reach a threshold of being activated if we perturb the climate sufficiently by increasing GHG concentration. I think the Holocene provides compelling evidence that there isn’t likely to be any major switch leading to internal fluctuations comparable to the effect of doubling CO2. If there is a switch, it is most likely to be activated only by some major change in the climate regime — such as entering an ice age or doubling CO2. If we activate a switch by doubling CO2, it is of course impossible to rule out the chance that the behavior of the switch will have sensitive dependence to initial conditions. It is impossible to evaluate that until someone comes up with a specific proposal for what such a switch might be. The kind of switch operating during glacial periods, leading to D-O events, is unlikely to work in a warm climate with relatively little ice. This is distinct from and more subtle than the usual “chaos fallacy” which reads something like “We can’t predict next week’s weather, so how can we make global warming forecasts 100 years out? :” It’s a fallacy nonetheless. It leaps to the conclusion that the theoretical possibility of long term chaos due to some undiscovered mechanism in the present climate regime (for which there is as yet no particular evidence, or any specific proposal) definitely trumps the changes in decadal statistics arising from changes in the GHG increase. If I have misunderstood Pielke Srs. intent, and he only means that when we increase GHG’s there can be surprises in the response of the system that are not anticipated by present models, well that’s a conclusion to which I would heartily subscribe, especially given that it was our main point in the NRC abrupt change report. For example, the Greenland ice sheet could prove a lot more unstable than people think, or high polar clouds could lead to unanticipated warming once the summer sea ice is gone. Either could precipitate a major shift. Such things are “unpredictable” in the sense that they are left out of current models, but it’s far from clear that they are “unpredictable” in the sense that whether or not they happen is sensitively dependent on initial conditions. In any event, it is the predictable long term growth in temperature in the system consisting of atmosphere and upper ocean — which has no long term chaos in its climate — which provides the setting for any such surprises. (1) The “fast response” component of the climate system, consisting of the atmosphere coupled to a mixed layer upper ocean, has very little natural variability on the decadal and longer time scale. The Earth’s atmosphere doesn’t support persistent storms analogous to Jupiter’s Great Red Spot. For the Earth’s “fast” system, changes in decadal statistics can be computed on the basis of changes in forcing such as GHG’s, without any need for knowledge of the initial conditions. (2) If we enlarge the system a bit to include upper ocean dynamics in the Tropics, we get El Nino, which clearly is a nonlinear chaotic phenomenon exhibiting predictability loss on a time scale of several years. Thus, we have no hope of predicting the state of El Nino in the year 2050, with or without GHG increases. The occurrence of El Ninos in particular years, and their strength, will somewhat affect the global and tropical mean temperatures, but unless El Nino starts doing something really, really different, this effect is likely to be much smaller than the temperature increase due to doubling CO2. (3) Now, if we enlarge the system further to include the deep ocean, we have a nonlinear system with a component that has response times on the order of a millennium. It is here that I think William might overstate his case a bit. On first principles, it would be possible for this system to exhibit chaos and initial condition sensitivity every bit as bad as the weather, but on time scales of centuries to millennia. That would mean that doubling CO2 would still have an effect on the “climate,” but that one might have to wait a thousand years to get good enough statistics to see it. This is a possibility in the abstract, but the present behavior of the climate system, the behavior of coupled atmosphere-ocean models in modern conditions, and the record of Holocene climate changes do not give any hint that such a thing occurs. It is a very interesting thought experiment to ask what the plight of climate modellers would be if industrial civilization had arisen earlier, somewhat after the Last Glacial Maximum when D-O events were common and maybe even the Younger Dryas was looming. I think we should agree that D-O events, imperfectly understood though they may be, are the result of some chaotic nonlinear system which is probably sensitive to initial conditions. I doubt whether one could reliably forecast the course of a D-O event, any more than one can reliably forecast El Nino. In that case, there is the interesting question of whether the uncertainty in the course of the D-O event would swamp the predicted response to doubling CO2. If we had better models of D-O events, we could answer such questions. In any event, since the climate system does not exhibit anything much like D-O events during the Holocene, the possibility of long term chaos of this sort in the unperturbed system seems rather remote. Not impossible on first principles, clearly, but decidedly unlikely. Thus, I’d say Roger Sr’s concern is apt, in the abstract, but is vacuous until somebody ponies up a credible atmosphere-ocean-glacier mechanism that exhibits chaos of such a nature that the sensitivity of trends in its decadal statistics to initial conditions swamps the sensitivity of these statistics to the increase of greenhouse gases. One could clearly concoct toy models that do such a thing, but coming up with a mechanism that credibly operates in the real world is another matter. This is not directly chaos theory so I understand if it’s deleted. But in some way it is… it’s economics… a old debate is resurfacing, as far as I can tell, the debate abut that the projections (of the temperature) being false or just bad sins (IPCC) they build on unrealistic developments for the poor part of the world (especially for the lower temperature boarder). So how is this handled now? I realise that this is not an economic site, but since the climate models involves this as well an answer would be nice. From the Livermore article for year 2300, the 14.5 F (8 deg C) is global, 20 deg C is for polar regions alone. and… “The temperature estimate is actually conservative because the model didn’t take into consideration changing land use such as deforestation and build out of cities into outlying wilderness areas,” Bala said. I think the short answer is that yes, there’s an issue, but it’s not debilitating. If you fix the market exchange rates with PPPs, you have to adjust growth rate expectations as well, which is offsetting. Even if the SRES scenarios have some bias, it’s more or less lost in the noise of other uncertainties. Plenty of other work has been done outside the SRES that does not suffer from the PPP/mkt issue (including global aggregate models), without a large conspicuous disconnect. The whole debate seems rather silly when you put it into the context of bigger questions: What will 8x current consumption actually look like in the developed world? Where is the resource base to support convergence? What about the possibility of global warfare or Malthusian scenarios? Once again, a great topic for discussion. Regarding the models, it seems that climateprediction.net has the most powerful approach. Comparing the results of many different models is a common approach in other scientific areas, such as genetic phylogeny. If you take the view that a model is an ‘in silico’ experiment, you want to conduct many such experiments and look for convergence or divergence. In particular, climateprediction.net has examined the variation in initial conditions, forcings and parameterizations in their first experiment and the resulting effects on model output. Go to http://www.climateprediction.net/science/model-intro.php for an excellent discussion of how to handle chaos. If the question you are raising is what policymakers need to know about climate science, I would say that they need to understand the probabilistic nature of modern physical science, not just climate science (read Richard Feynman on this topic). Nevertheless, we can still make accurate predictions in many cases, and dynamic systems still adhere to principles of energy and mass conservation. Here is an important subject for policymakers: Should we view the 2005 hurricane season as a normal, to-be-expected ‘event’ or as a once-every-hundred years oddity? How then should resources be distributed? Should low-lying flood plains be abandoned? Chaos seems to state that we will be unable to predict exact times and courses of hurricanes (similar to the bubbles in a boiling pot of water). Energy conservation seems to predict that sea surface temperatures will continue to increase. The link between SSTs and hurricane activity is complex and subject to other variables such as the moisture content of the atmosphere (which is linked to SSTs) and wind shear aloft. 2005 should probably now be thought of as a ‘normal’ season. I think that if you are going to listen to scientists on climate issues, you want to listen to people who have spent years of hard effort collecting data and doing nitty-gritty modelling studies – people like Lonnie Thompson, who has gone to extraordinary lengths at high altitude to collect an incredible dataset, and the group running climateprediction.net. It strikes me that you all (youse in Brooklynese) should arrange a session at the conference “20 Years of Nonlinear Dynamics in Geosciences” June 11-16, 2006, Rhodes, Greece. The purpose of this conference is to bring together scientists from the atmospheric sciences, hydrology, geology, and other areas of Geosciences to discuss the advances made and the future directions of nonlinear dynamics. Topics will include predictability, ensemble prediction, nonlinear prediction, nonlinear time series analysis, low-dimensional chaos, error growth in the models, nonlinear modeling, fractals and multifractals, bifurcation, and other aspects of nonlinear science. http://www.aegeanconferences.org. Re #41: Does anyone have an idea as to the identities of these 20 or 25 scientists (not clear if there was overlap between the two groups). A few of them are probably obvious enough, but if the oil industry really did succeed in recruiting that many of them, there are probably at least a few sleepers around. If one took the two meteorlogies(?) at 90 days and developed them forward [in climate model steps] to 50+ years hence. Are you certain that these two worlds would then have near-identical climate statistics? To Stefan: The ability to construct simple non-chaotic phenomenological models that “explain” D-O events or Milankovich cycle doesn’t prove that the events are not chaotic in their nature. Nor does it prove that they are chaotic in nature, either. The evidence points in the direction that they are not chaotic, so unless anyone can prove they are chaotic, most of the scientific community (i.e. the IPCC, et al.) are of the opinion that they are not chaotic, but are generated by predictable periodic shifts (such as variation of axial tilt or distance from the sun). You could look at this question from the other way around, i.e what are our total resources, and go from there. This is not a precise art by any means; the lowest numbers given I would regard as very likely to be achievable, the highest would require significant technological improvements. Oil: Conventional and Unconventional combined, lowest estimates for remaining are around 2×10^12 Barrels, highest (realistic) around 4×10^12 Barrels. 2.5 to 5 x10^14 kilos, giving total CO2 emissions of between 7 and 14 x10^14 kilos. Natural Gas: Combining Conventional and unconventional again, 10-20 Pcf total resources. This makes 3-6 x10^14 m3, ro 2-4×10^14 kilos, giving total CO2 of between 5.5-11 x10^14 kilos. Coal: Estimates range from 1 to 4 Trillion tonnes. Assuming an 80% carbon content, this gives between 2.9X10^15 and 13.6×10^15 kilos. Current annual emissions of CO2 from fossil fuels are around 7 Billion tonnes, or 7×10^12 kilos. There are in the region of 780 Gt of CO2 in the atmosphere, or 7.8×10^14kg. This is based on burning everything, of course, and it does not say anything about rates. Note that, paradoxically, low-resource cases will have higher annual CO2 emissions in the near term, sinply due to the use of coal as a substitute for oil and gas. From an emissions modelling basis, it should be noted that even the most heavily exploited fossil resources (North sea oil being an example) struggle to rise above 2% of total resources used per year. I wonder what Stefan would consider acceptable scientific evidence for the chaotic nature of D-O events (or to the opposite effect, for that matter)? After all, what we have is a very limited and noisy set of data points. Personally, I doubt that a definitive statistical test is possible. Intuitively, I tend to agree with Prof. Pierrehumbert because the sudden and seemingly unpredictable events of D-O type do assocaite, loosely speaking, with chaotic behavior. While I agree that the area is sort of gray, I strongly disagree with Stefan regarding the null-hypothesis. Until the modelers (no offense intended) construct a physical (not phenomenological!) model of climate that is able to capture events of D-O type the hypothesis of non-chaotic climate amounts to wishful thinking. I believe, one type of these mechanisms is referred to as “bucket”. The analogy is with a quantity of water accumulated in a slightly tilted bucket until the bucket falls on its side spilling everything. For example, a layer of fresh water slowly accumulating on the surface of N. Atlantic with sudden shut-down of THC. Or a sudden break-up of an ice-sheet due to slow build-up of a dynamic stress. Maybe it is just a bad analogy, but the bucket is not a chaotic system. It is a simple system with two stable states. But it is sensitive to the initial conditions as well as to the entire trajectory. You don’t know and you cannot know when the bucket will fall. So the stand-alone bucket is a simple system. The global climate with a gigantic built-in bucket is potentially (very likely) chaotic.